Sadiq Khan has warned that more affordable homes should be offered under any new plans for the stalled Earls Court redevelopment scheme and said that two housing estates under threat of demolition as part of the current plans should be “handed back entirely” to council ownership ahead of any alternative proposals for the site being brought forward. The London Mayor’s intervention in the controversial project comes as Capital & Counties (Capco), the property giant that has led it since its inception in 2009, is in discussions with Hong Kong company CK Asset Holdings to sell its interest in the 77-acre site. London Mayors have the power to seek amendments to or even take over for their own determination large planning applications that do not conform to their strategic policy objectives. Planning consents for the main part of development area, which falls within the adjoining boroughs of Hammersmith & Fulham and Kensington & Chelsea, were finalised by the two local authorities in November 2013 when both were Conservative controlled. The then Mayor, Boris Johnson, gave the scheme a green light, hailing the Earls Court Project as a “landmark scheme”. However, progress has been slow due largely to a recent fall in demand for “prime” Central London dwellings, the advance sale of which was integral to the financial structure of the project, and there has been an energetic residents’ campaign to prevent the demolition of West Kensington and Gibbs Green and against the scheme as a whole, which has seen the destruction of the famous Earls Court exhibition centre but none of the proposed new housing built in its place. The political climate has also changed, with Labour controlling Hammersmith & Fulham since 2014 and pledging to get a better deal for the estates’ residents, and Khan succeeding Johnson at City Hall in 2016. Amid deteriorating market conditions, Capco has been preparing to split the Earls Court part of its London operation from its profitable holdings in Covent Garden. 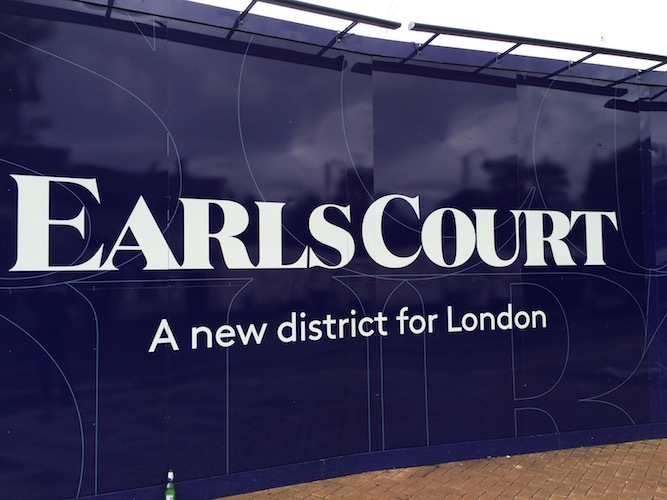 A separate section of the Earls Court scheme called Lillie Square, which stands to the south of Lillie Road, would not be included in any future sale. In his statement, Mayor Khan stressed his view that the two estates should be returned to Hammersmith & Fulham before any new planning application can be progressed in order to “ensure my concerns are addressed”. The estates are currently subject to a conditional land sale agreement (CLSA) made in 2013 between Capco and the borough’s previous Tory administration, under which ownership of parts of the estates would be successively transferred to Capco once replacement dwellings for residents had been built elsewhere in the development area. The Tories had accepted a total offer of £105 million for the estates land. The Mayor’s intervention will be seen as effectively signalling to Capco and to CK Asset Holdings and any other potential buyers that the GLA will not play ball unless the CLSA is torn up and an ensuing planning application includes a far higher proportion of additional social rented and other “genuinely affordable” new homes in the area than the one in place at present, he will step in to prevent it being consented in that form. With replacement homes for those on the 760 on the two estates taken out the equation, the additional “affordable” housing Capco’s current plan envisages amounts to just 11% of the total number of new homes – 740 in all. Khan has a policy of fast-tracking schemes which propose a minimum of 35% “genuinely affordable” homes but “viability testing” those that don’t. Hammersmith & Fulham leader Stephen Cowan claimed earlier this year that he and Capco chief executive Ian Hawksworth had reached agreement over the estates’ return, something Capco disputes. A potentially complicating aspect of any sale of its Earls Court assets by Capco is that in 2014 it formed a joint venture company with Transport for London to redevelop the exhibition centre part of the site. It is thought that as the smaller of the two partners, TfL would have little say in what Capco did with its share, though the situation is presently unclear. Were a future Earls Court application called in by City Hall, the decision about it would, in practice, be likely to be delegated to the deputy mayor for planning, Jules Pipe, because the Mayor himself would be deemed to have a conflict of interest as he is chair of the TfL board. Another section of the site, the Lillie Bridge London Underground maintenance depot, which is as yet unaffected by the regeneration, is also owned by TfL. It’s unfair to other journalists, that Dave Hill gets the best scoops! You must have been prompted by catching the ingenious light-show projected onto the Earls Court site on 9th November, beseeching Mayor Khan. It is true that Sadiq Khan has had long-held serious concerns about the Capco Earls Court scheme’s affordable housing provision of only 10%: On 15 July 2015 he coined the expression “viability con”, in referring to Earls Court.